This entry was written by whyevolutionistrue and posted on May 11, 2018 at 12:18 pm and filed under spot the nightjar (and other beasts), spot the ________, Uncategorized. Bookmark the permalink. Follow any comments here with the RSS feed for this post. Both comments and trackbacks are currently closed. I gave up on squirrel and looked for moose. No luck there, either. 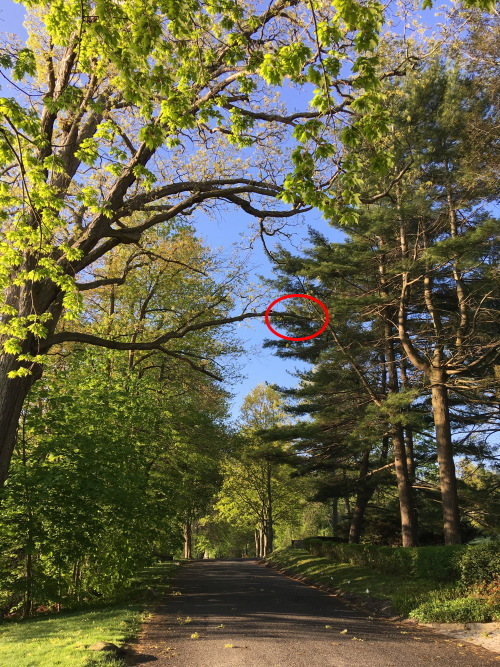 Strangely enough, that’s where I figured it was, the dark blob on the limb. I’ve discovered there’s a problem with this image with the red oval. It has much less resolution than the original image. Using the red oval one as a guide, I can see the squirrel in the high-res original! Ok, I’ve added a space after “https:” to stop WordPress from showing the image instead of the link.